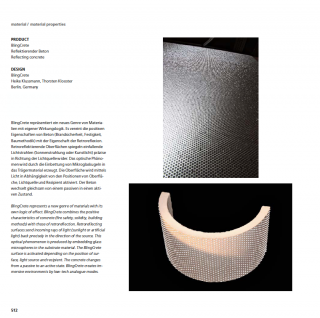 BlingCrete - Light re­flect­ing con­crete – is fea­tured in the iF Prod­uct and Ma­te­rial year­book 2012. In the Compi­la­tions of year­ly de­sign awards, th­ese books fea­ture the best of prod­uct and ma­te­rial de­signs, along with a se­lec­tion of out­s­tand­ing cre­a­tives work­ing to­day. The iF prod­uct de­sign award was in­tro­duced in 1954 and is an­nu­al­ly con­ferred by iF In­dus­trie Fo­rum De­sign of Hanover, Ger­many. 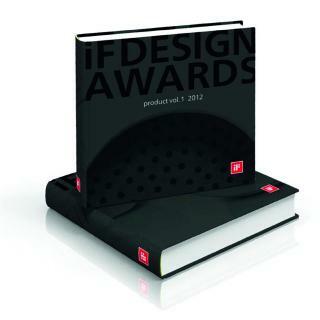 Each year the iF award at­tracts more than 2,000 en­tries from 37 coun­tries, which are then judged by ex­perts in the re­spec­tive fields. The win­n­er of each field re­ceives a seal of out­s­tand­ing de­sign qual­i­ty; the iF gold award is con­ferred on the best de­sign ob­ject over­all. This Prod­uct and Ma­te­rial year­book fea­tures the best in in­ter­na­tio­n­al prod­uct de­sign, fo­cus­ing on new­ly de­vel­oped ma­te­rials and the in­no­vat­ed use of ex­ist­ing ma­te­rials.